Okay, who's in charge of toy naming over at Hasbro? We'd like to hear some explanation for why this isn't just called "Ultimate Thor." 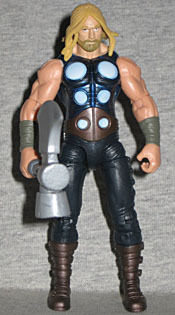 Especially when there was already a figure in the Thor line called Battle Hammer Thor. Did the wrong file get copied and pasted? Banished by his enraged father to the tiny realm of Midgard, Thor wandered the wild lands of Earth for many years. Only recently has he found a group of warriors worthy of being called his peers. More important, his association with the heroes of Earth has provided him with enemies worthy of the power of his hammer. There was some discussion, when the Thor toys came out, as to why we were only getting movie-inspired figures, not comics. Well, the official word was that there just weren't enough comic versions to warrant inclusion (which seems logical, considering how many minor variations of Thor the line already had), but a perfectly valid secondary reason would have been "we're waiting to release those alongside Avengers." The last time we got an Ultimate Thor, his hair was just about chin length, and he had a mustache and goatee. Clearly some time has passed in Thor's personal history, because his hair now falls over his shoulders slightly and he has a full beard. That mirrors the evolution of the art in the comics, where he's gotten hairier over time. The body is unique to this release - there's no other figure that could have lent their pieces to the big guy, here. He's wearing his vest with the big discs embedded in it and the weightlifter's belt to keep him from getting a hernia. His boots have six straps each - three over the foot, three up the shin - and his pants apparently snap up the sides like he's about to tear them off courtside in the NBA. He completes his ensemble with wraps around his forearms; no fancy tech, no gloves, just cloth all up around his arms. A lot of the Avengers toys (like Captain America before them) are rather lacking when it comes to articulation. 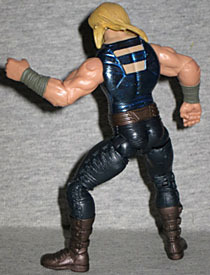 Thor doesn't have wrists, ankles or a waist, but the rest is decent. We're talking swivel/hinge joints at the knees, hips, elbows and shoulders, and swivel thighs. The head is a balljoint, but the range of motion on it is poor enough that it might as well be a swivel. The vest is metallic blue, while the pants are flatter. His discs are light blue with a darker shade around the edges. The boots and belt are the same brown, and the wraps on his arms are grey. He's got a very pink skintone, and his beard is darker than his hair. 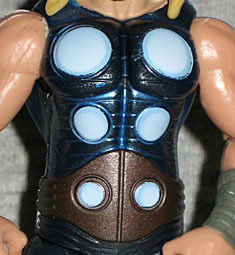 Naturally, Thor comes with his hammer, though as per usual, it's got a big axe head on one side. And actually, the proportions make it look more like an axe with a hammer on one side. 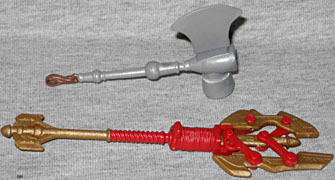 He also has some red and gold monstrosity that the packaging claims is a hammer but looks like a spear or something. Maybe an axe, but not a hammer. It's not anything special, and will swiftly be forgotten. See you in Helheim, you stupid piece of junk! Between the Iron Man 2, Captain America and now Avengers movie lines, you can build a pretty decent team of Ultimates. Thor's the first one I've got, but he won't be the last. This figure may not be up to Marvel Universe standards, but he's not too bad. Worth picking up on a two-for-one sale, for sure.